Celebrate all things maple in Canada! 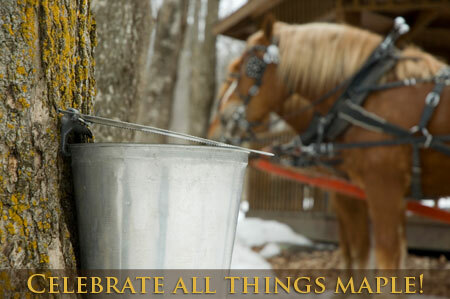 We've asked our Facebook fans to share their local maple festivals on our Facebook page. Like us on Facebook, see their recommendations, and share your experiences! Become a fan of BBCanada.com on Facebook! It’s that time of year again…sap has started to drip from the trees and the makers of maple syrup will start the process of tapping them and turning their sap into liquid gold! There is nothing like real maple syrup and once you experience it, how do you ever go back to anything that is not the REAL thing! Many Canadians and visitors from abroad celebrate this season by visiting sugar shacks around Ontario and Quebec, Nova Scotia and New Brunswick in the months of March and April. Festivals abound in these provinces! The tradition of this visit is often a family affair as children learn how the maple syrup is made and then leave with special maple treats to take home. Maple taffy, maple sugar, maple candy and more! Even Tim Horton’s gets on the band wagon with their very own maple treats at this time of year! Make sure to visit the heated pancake houses for a delicious meal with REAL maple syrup! Celebrate something uniquely Canadian! With a production level of close to a million litres per year, Ontario is the second largest producer of maple syrup in the country next to Quebec. It takes approximately 40 litres of maple sap to make 1 litre of maple syrup. Canada produces 80% of the world’s pure maple syrup, 91% of which is produced in Quebec. Les cabanes à sucre (sugar shacks) abound in Quebec. Some of these delightful maple producers have been operated as family businesses for decades, and even centuries! The Érablière du Lac-Beauport has its own maple museum showing the history and modernization of the maple industry and they do tours in both English and French. La Goudrelle is situated in the Montérégie on the South-Shore of Montreal! Visit their mini farm, walk in the mountains nearby and take a sleigh ride. They also have a venue for special events. One of our BBCanada.com member B & Bs Le Love Du Pionnier has their very own sugar shack! Gîte demilie au bord du fleuve, another of our members has maple products for sale at their sugar shack during the sugar season. Sucrerie Jean-Louis Massicotte and daughters near Champlain is open from March 21st until April 28th and has been Family owned since 1710. Since 1950, the Cabane à Sucre des Sportifs has been inviting families to come and enjoy a traditional sugaring-off meal. Sugaring-off menu, taffy on the snow, sleigh ride to visit the dairy farm, pitching machine for softball practice, music and dancing, indoor floor hockey for minor teams only (reservation required) and many other activities await you. Explore the culture of this golden liquid in La Belle Province, by following the Gourmet Maple Road. 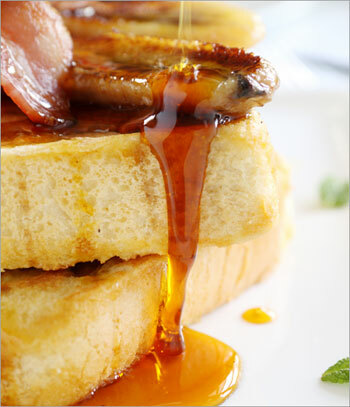 Pure Canadian Maple Syrup tops off a delicious french toast breakfast! 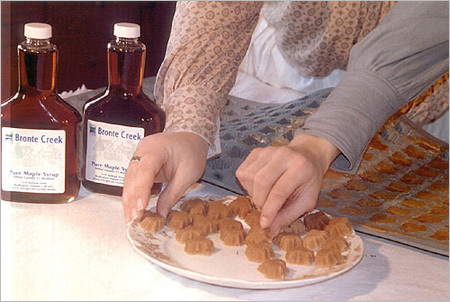 The Bronte Creek Provincial Park Maple Syrup Festival specializes in the Late Victorian Time period (1890's). Even the tour guides dress the part and take you back in time. The maple syrup festivities are open to the public from 9:30 am to 3:00 pm every weekend in March and from 9:30 am to 3:00 pm and daily through March Break at the Burlington park. 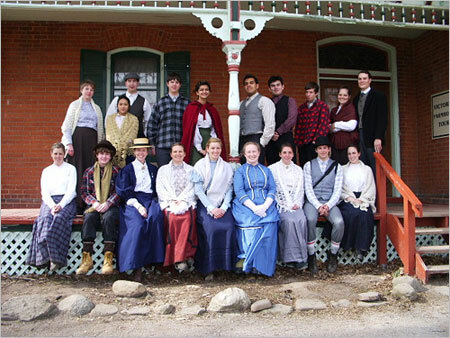 Westfield Heritage Centre in Rockton Ontario is one of the most charming historical destinations in Ontario. The property boasts a group of 30 historical buildings which have been restored to reflect their historical roots. Costumed interpreters give you the real sense of going back in time to experience early Canadian culture. The Westfield Maple Syrup Festival runs March 3, 10, 13, 14, 17, 24, 29 & 31 from 10:00 am to 4:00 pm. 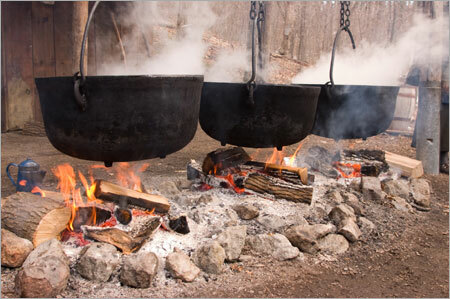 At Westfield visitors will explore the making of maple syrup from the tree to the table in three different time periods: the methods of Canada’s First Nations, 19th century pioneers and modern times. Families can experience a complimentary old-fashioned horse and wagon ride and purchase a delicious pancake breakfast. For more information, please call 1-800-883-0104 or visit the website. Warkworth Maple Syrup Festival takes place March 9th and 10th. Activities abound in Warkworth this coming weekend with sap making demonstrations, free taffy on snow tastings, horse drawn sleigh rides, nature trails, a log sawing contest, three person plank race, snowshoe competition, a juried arts and photography show, indoor mini golf and lots of musical entertainment! Of course celebrations won’t be complete without the scrumptious pancake breakfast! Buckhorn Maplefest celebrates their 20th anniversary this spring! The festival runs weekends March 16, 17, March 23, 24, March 29, 30 & 31. 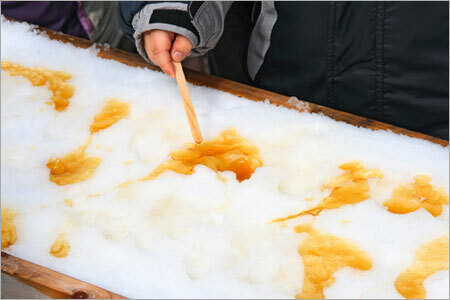 Visitors can try their hand at tapping a tree, testing their taffy on snow, and of course indulging in a pancake meal. Everyone will enjoy listening to the live music featured all day long! Saugeen Bluffs Maple Syrup Festival is the biggest in Grey County, and takes place just north of Paisley Ontario on March 23 and 24th. The line-up includes star performance from 'Canada's Got Talent' - R & R Pet Paradise, a wildlife show, a blacksmith and more! Celebrate the 12th annual Maple in the County! in Prince Edward County March 23 and 24th. When you have filled up with pancakes, come out to the first SUGAR SHACK SHIN DIG. Enjoy a local dinner by Chef Matt DeMille and wear off the delicious meal on the dance floor all on the historic grounds of Macaulay Heritage Park. Sugarbush Maple Syrup Festival Kortright Conservation Area happens March 2nd- April 7th. Enjoy pony rides, balloon twisters, magic shows, face painting, clog dancing and more! Guided tours every hour on the hour between 10 am and 4 pm. Orangeville Maple Syrup Festival takes place March 23/24. 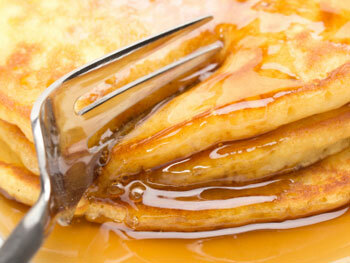 Enjoy all you can eat pancakes at the Delta Maple Syrup Festival on April 20th and 21st! On Saturday April 20 Elmvale’s 48th annual festival features a midway starting on the 19th, pancake eating contests, craftspeople and musical entertainment! Powassen Maple Syrup Festival holds their 16th annual festival 20 minutes north of North Bay on April 27th. At Shaw’s a visit to the pancake house and sugar bush tour is a perfect way to spend the day with the family. Hours are daily from 8 am – 4 pm until April 14. The family farm was established in 1858 and they are going strong today! World’s Largest One day Maple Syrup Festival takes place in Elmira on April 6th. The 49th annual festival will have 2000 volunteers! Nearly 70,000 people come out to experience this long time tradition in the region. Museo Park Vanier the first sugar shack was built in the Richelieu forest by the White Fathers who made syrup for their religious community. The order left Vanier in the mid-1970s. After their departure, a group called Action Vanier took over the tradition and rebuilt the sugar shack on the same site as the White Father's original sugar shack. Since 2012, the Vanier Museopark has been in charge of the sugar shack. The sugar shack is also available to rent for special events! Enjoy Sugarbush Tours in Lanark county west of Ottawa at Fultons Feb 16th - April 21st and Wheelers who are open daily 9-3 pm 7 days a week during the spring sugar season. 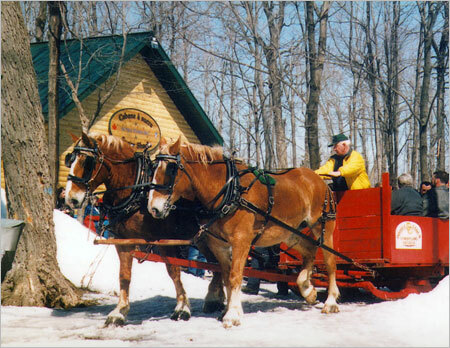 Stanleys Old Maple Farm just minutes from Ottawa is open until April 7th every weekend and daily during March break. Check out their website and watch the Rick Mercer Report with Environment minister Rona and Rick visiting the sugarbush. 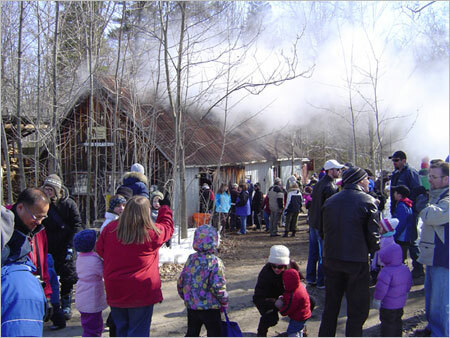 Proulx Sugarbush is in Cumberland Ontario (close to Ottawa) and celebrates with maple syrup related activities from the beginning of March to mid April. Nova Scotia Festivals take place throughout the months of March and April. In St Quentin, New Brunswick the Maple Capital of Canada Festival is celebrated from March 26th to March 31st. Visit these unique festivals as we celebrate Canadian Maple syrup this spring! Why not consider a B & B stay in one of the regions while you are there! Visit BBCanada.com for many accommodation options!